I have not been posting lately for a few reasons. I graduated, so some of the time I've been taking it easy. Another factor is that since I am not in school, I am frankly less driven to write. Part of my writing here is a result of the intellectual stimulation of graduate school, as well as a bit of a stress release. The other big reason that I have not been writing is that I have spent a decent amount of time looking for a job. Now, I've found a job that I think is a pretty good fit. The position is at a real estate/development consulting firm, doing primarily New Market Tax Credit work. I'll be doing financial and market analysis, some asset management/project compliance stuff, funding applications, etc. I'm very excited about the folks I'll be working with - they all seem quite intelligent, hard working, and amenable. The only catch is that the job is in Chicago. 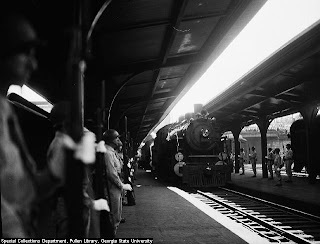 As readers of this little blog, you are probably quite aware how much I love Atlanta. It would take a very good opportunity for me to leave - and I think this job is a great opportunity. So I'm moving. I'll be in Chicago looking for a place to live next week, and moving the week after that. Terminal Station has been up for a little over two years - the first post was May 20, 2008. The blog was never more than a side project, although I've had a lot of fun writing it. I've enjoyed having a forum to post my gripes, thoughts, and stories relating to the city, even if it sometimes feels like I'm just shouting out into the void. I think blogging is an inherently narcissistic act, that you can't really do for any reason other than you like to hear yourself talk. In that respect I guess it has been incredibly satisfying, but it is much more rewarding when I get emails and comments from readers who appreciate whatever perspective I'm able to bring to an issue. I was never the kind of blogger who was going to write every day, multiple times per day. I would sometimes get on a roll and I'd see traffic spike, but was always unable to keep up the pace. My most ambitious project was analyzing the APD crime data, which resulting in the highest traffic day right after posting the GIS maps my fantastic friend Cassie created for me. Like so many things with this site, I never finished all the slicing and dicing of the data that I wanted to do. However, I was quite pleased by the work we did get done (with much help from Cassie and El Hermano). I'm not really sure why, but my post about the change in DOT leadership is the most-read post by a far - 5 times more read than the next most popular post, in fact. My complaints about Mary Norwood were also popular. FTR, I did gain a begrudging respect for Norwood's campaigning ability, although I'm still not a fan of her legislative abilities. My analysis of the Medical Arts Building as an example of why so much of Downtown remains underutilized. I will be back in Atlanta to visit quite regularly, but otherwise I'll be up north. I will be in Chicago for the indefinite future. I'm excited for many, many reason. One friend reminded me that I'll only be three hours from my beloved Blimpy Burger and Michigan football. I'm also super psyched to live in a city where I won't need a car. I am leaving the blog up on blogspot, although I won't be renewing the www.Terminal-Station.com domain name. TerminalStation @ gmail.com will still get forwarded to me if you need to get in touch for some insane reason. Thank you all for reading! Goodbye for now. Fantastic and congratulations. But we're counting on you straightening out Chicago as quickly as you can and getting right back to Atlanta. Best wishes. Congratulations! The blog was good to have around while it lasted. You did job of keeping it up. Good luck in Chicago. Congrats man-- I don't know how I came upon your blog, but for more than a year now, I've really enjoyed reading it. It may have been narcissism, but seeing you in my RSS queue always gladdened my heart. Good luck Ben! Chicago is probably my favorite American city, I think you'll love it there. There's enough density and a good enough transit system that it functions like a real city, but it's not quite as cramped as New York. Gorgeous, near water, lots to do, wonderful food. I'd think about moving there myself if the winters weren't so brutal. I've enjoyed reading this blog too, thanks for writing it. I've enjoyed your blog. I hate to see it go. Thanks very much for putting so much into this blog. Yours is one of the few Atlanta blogs that I kept up with. I wish you the best in your next adventure. Hope you can find a place close-in, such a great city. I miss the food and music most; the weather not-so-much. Thanks for all the stimulating writing!